The ionosphere, one of the regions of the upper atmosphere, plays an important role in global communications. Ionized by solar radiation, this electricity-rich region is used for the transmission of long wave communications, such as radio waves. Now Prof. Colin Price of Tel Aviv University's Department of Geophysical, Atmospheric and Planetary Sciences, working alongside PhD candidate Israel Silber, has discovered that the radio waves reflecting back to Earth from the ionosphere offer valuable news on climate change as well. Their research shows that the strength of radio signals on the ground is a reliable indicator of temperature change above. Prof. Price and his team used simple radio antennae on the ground to measure radio waves broadcast by navigational transmitters around the globe, then compared information on the strength of these radio signals with data on temperature fluctuations in the upper atmosphere. They discovered that climate change in the upper atmosphere—caused by an abundance of greenhouse gases—may lead to a greater absorption of radio waves. Weaker signals could therefore be indicative of greater climate change. Detailed in the Journal of Geophysical Research, this simple, cost-effective measurement can be a valuable contribution to the ongoing effort to track climate change, says Prof. Price, adding to measurements of ground and lower atmospheric temperatures to create a more holistic picture. 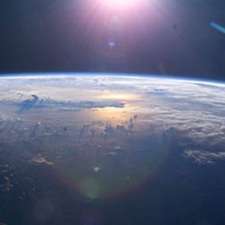 On the Earth's surface and in the lower atmosphere, an increase of greenhouse gases has a warming effect, the gases acting as a "blanket" and keeping heat from escaping from the Earth into space. But these gases, including carbon dioxide, are increasing in the upper atmosphere as well, where they have a cooling effect. When cooled, the ionosphere contracts and descends into the atmosphere to where air is denser – leading to a higher absorption of radio waves, Prof. Price explains. By examining satellite-gathered data on the temperature in the upper atmosphere and comparing results to measurements of radio wave amplitudes collected on the ground, the researchers were able to uncover a clear correlation, consistent over time. As the upper atmosphere gets colder, radio signals lose their strength. While the sun is certainly the driving force behind changes in temperature in this region, it accounts for only 60 to 70 percent of temperature variations, says Prof. Price. The remaining variability could not be systematically measured until now. By adding measurements of radio waves taken on the ground to solar radiation estimates, researchers can now explain approximately 95 percent of temperature changes in the upper atmosphere. According to Prof. Price, this new technique will be a valuable addition to current methods of monitoring climate change, such as the measurement of ground temperatures. Without the need for expensive equipment like satellites, monitoring the upper atmosphere can be done inexpensively and continuously. And because temperatures in the upper atmosphere fluctuate more dramatically than those on the ground—for every one degree of warming in the lower atmosphere, there is a corresponding ten degree cooling in the upper atmosphere—changes are far easier to monitor. Using this system might reveal more about the ionosphere than ever before. The region is notoriously difficult to monitor; there are no weather balloons or airplanes that can go high enough, and it is too low for orbiting satellites. But with this method, it could be possible to study long and short term changes in the ionosphere, such as the impact of solar storms or thunderstorms on the upper atmosphere. By adding measurements of radio waves taken on the ground to solar radiation estimates, researchers can now explain approximately 95 percent of temperature changes in the upper atmosphere. Sounds great, but..., as has been pointed out repeatedly, they use outdated and incorrect models to explain the solar wind and it's interaction with Earth's EM field. Also, according to several posters here who believe their opinion is worth something claim the temp of the ionosphere is meaningless, swift.